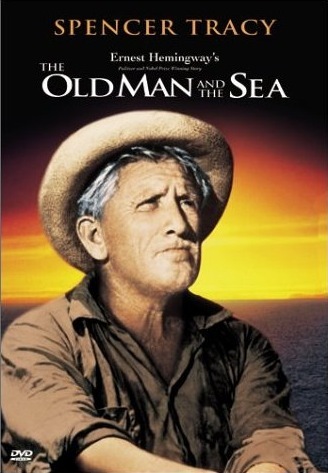 As a movie The Old Man and the Sea, the 1958 film starring Spencer Tracy, is only a notch above a TV movie of the week. As an adaptation, however, it is one of the finest I’ve ever seen — if what you wanted to see was a movie made as close to a book as possible. After suffering through a few putrid Hemingway movie adaptations, that’s exactly what I wanted. Or so I thought. As the saying goes, be careful what you wish for. You just may get it. I’d say 75% of this movie was lifted, word for word, from the book. Especially the narration. Therein lies the movie’s charm, as well as its biggest drawback. The book is incredibly true to Hemingway’s beloved novel. So much so that it looks and feels like a documentary. Maybe no actor is up to the task of portraying Santiago, the old man who battles the big fish far out in the ocean. Spencer Tracy was an incredible actor. And yet I wasn’t intrigued, compelled to watch, or enchanted. The movie felt flat to me. If this movie were made today, computers could create a realistic-looking great fish. As it is, the special effects really aren’t anything to write home about. And it appears the film studio couldn’t say, “No sharks were harmed in the making of this film” because it appears quite a few sharks were harmed — stabbed, clubbed, and otherwise dismissed without a speck of remorse. No worries. The sea will make more. On a scale of 1-10, I’d give this movie a 5. It’s not one I could watch again. But it’s a movie that I thought truly captured the spirit of the novel on which it was based.